To celebrate what would have been the Queen frontman’s 70th birthday, Asteroid 17473 has been given the legendary singer’s name. In a touching ceremony last night (Sunday 4 September), Mercury’s Queen bandmate Brian May - himself a doctor of astrophysics - announced that International Astronomical Union's Minor Planet Centre had designated Asteroid 17473, discovered in 1991, in Freddie’s name. 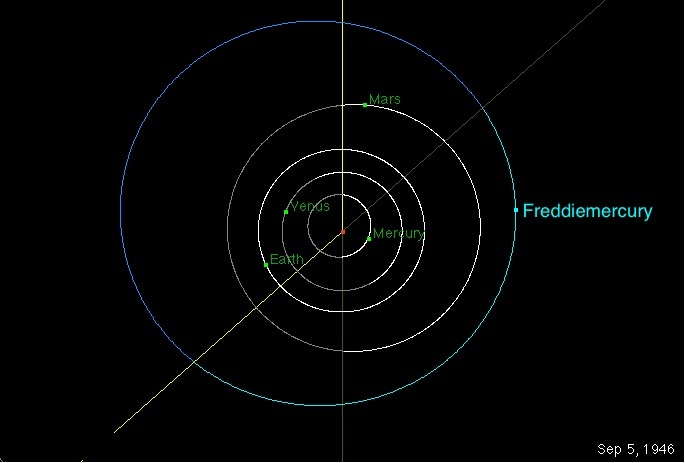 This means that the space rock will now known as Asteroid 17473 Freddiemercury. Speaking via a video message, May told a group of fans who had gathered at Montreux Casino all about the position of the asteroid. “It’s in the main asteroid belt, out between the orbits of Mars and Jupiter, and is about 3 and a half km across. Like many asteroids, it’s a dark object – rather like a cinder in space. Viewed from the Earth it is more than 10,000 times fainter than you can see by eye, so you need a fair-sized telescope to see it … and that’s why it wasn’t discovered until 1991. “Singer Freddie Mercury sang, I'm a shooting star leaping through the sky - and now that is even more true than ever before. Dr Brian May also has his own asteroid, Asteroid 52665 Brianmay, named in 2008 on the suggestion of his friend, the astronomer Patrick Moore.